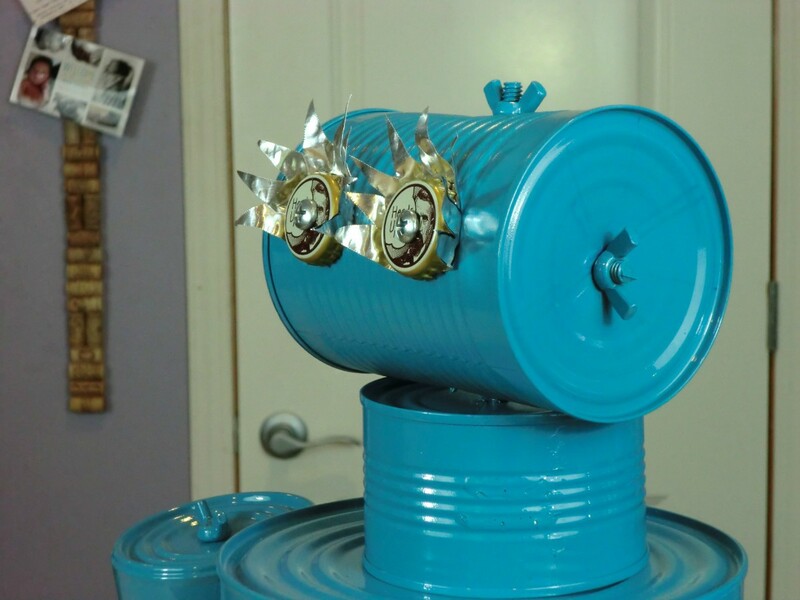 A great way to reuse tin cans is to make a tin can robot! This particular robot took a few hours to put together. 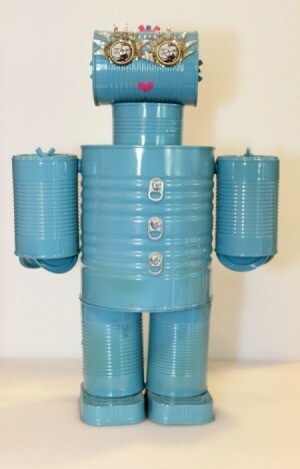 I will give step by step instructions for how I put this together, but no robot needs to be alike! 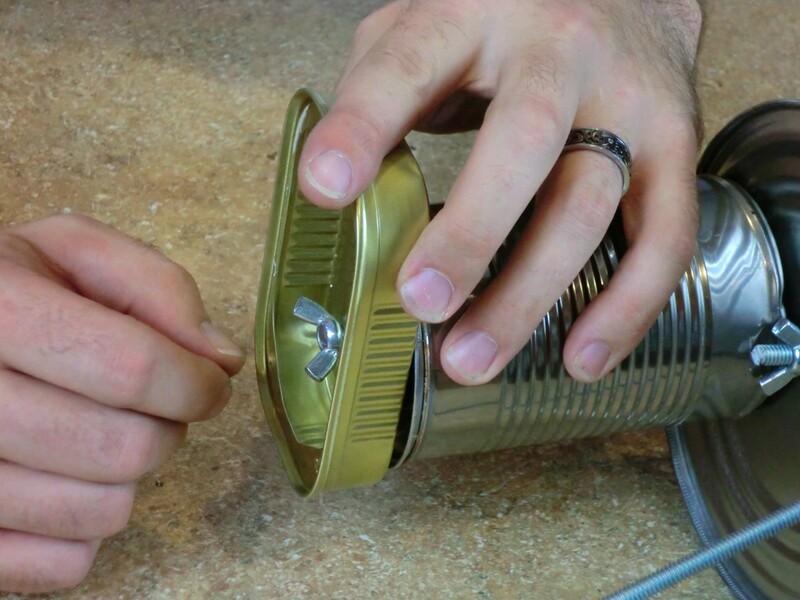 Hopefully this project will give you a starting point to make your own, unique tin can robot. 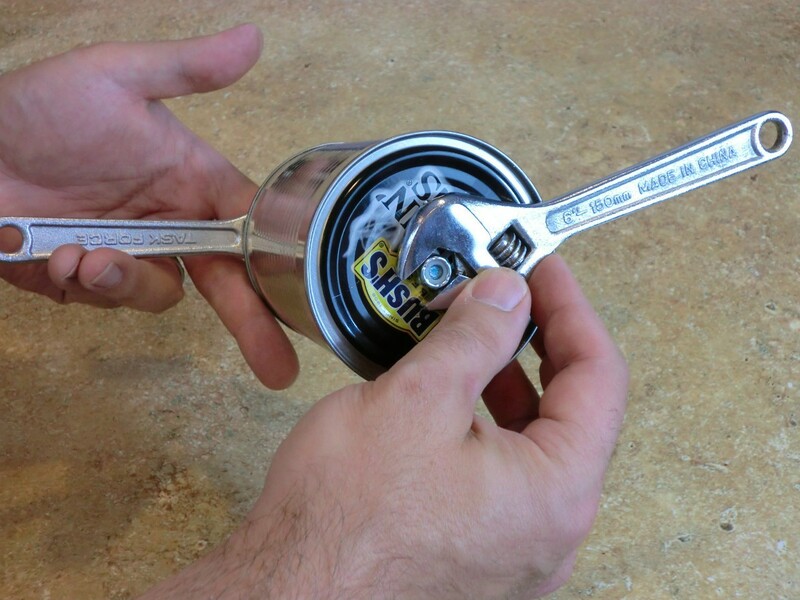 Imported: Make sure that as you are collecting your cans that you are using "smooth edge" can opener. It allows you to use all the lids that you collect as well as the cans! I started by assembling the head. 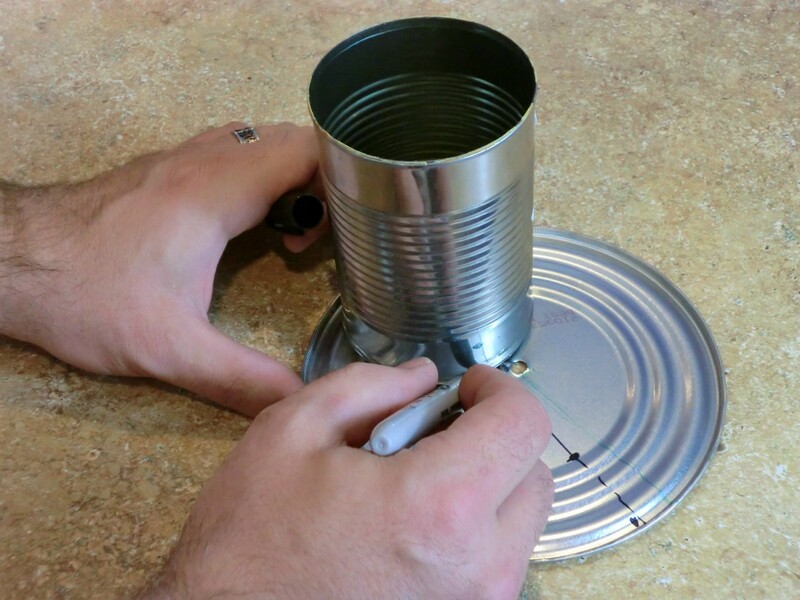 I drilled holes in the center of the detached can lid and the bottom of the can. I then measured a length of threaded rod that would allow me to put nuts on either side. This holds the head together. I used a hacksaw to cut the threaded rod. 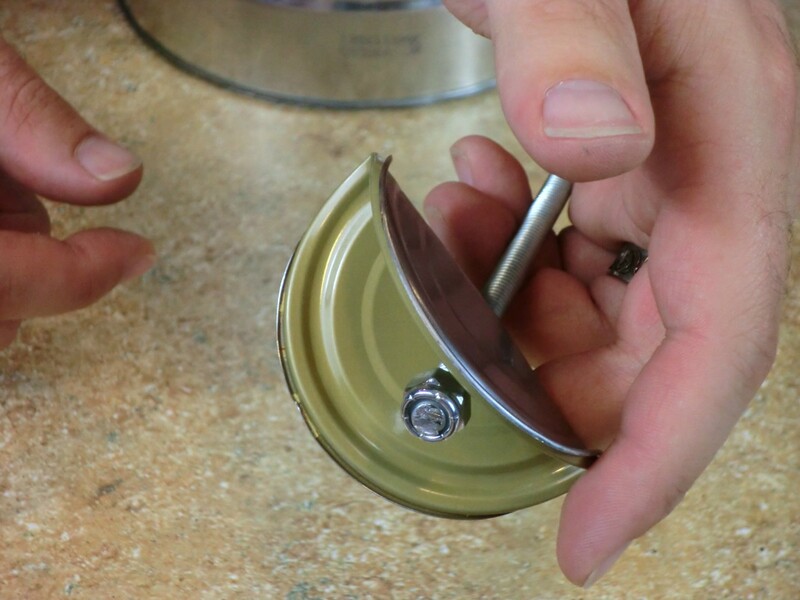 Unfortunately, the side that I cut would often get marred to the point that I couldn't attach a nut and I can to spin the nut from the uncut side. 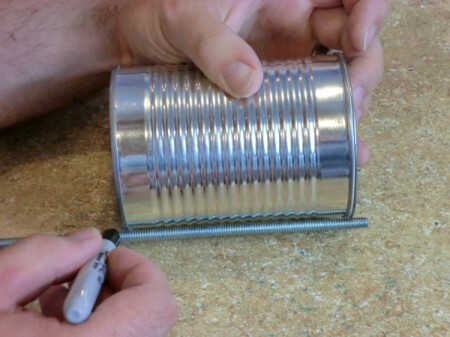 This makes it preferable to buy smaller threaded rods, so that you don't have a lot of waste. 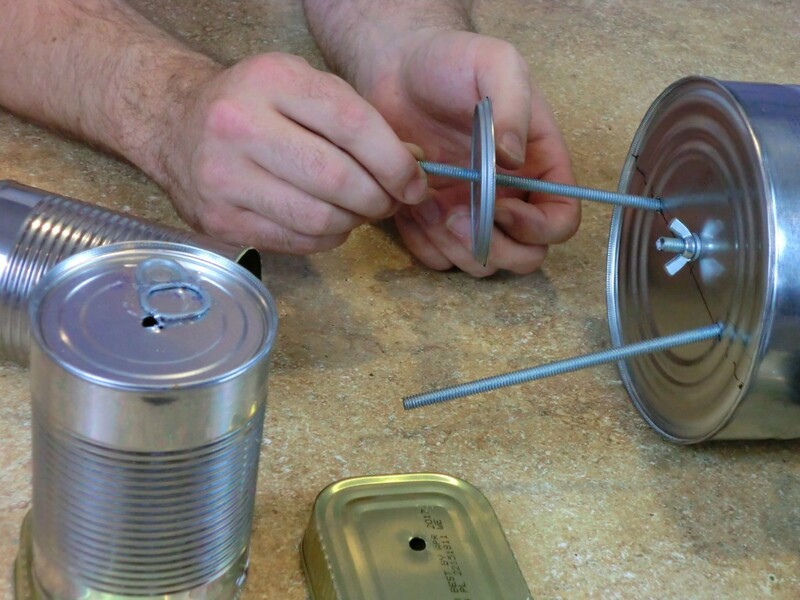 You can also put a tin can robot together with heavy gauge wire! 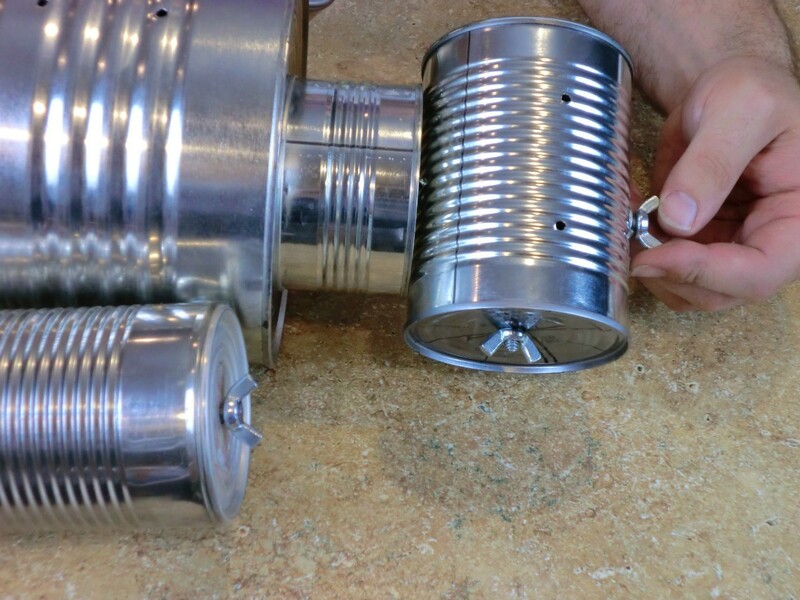 Assemble the head with lock nuts or nuts and split lock washers. 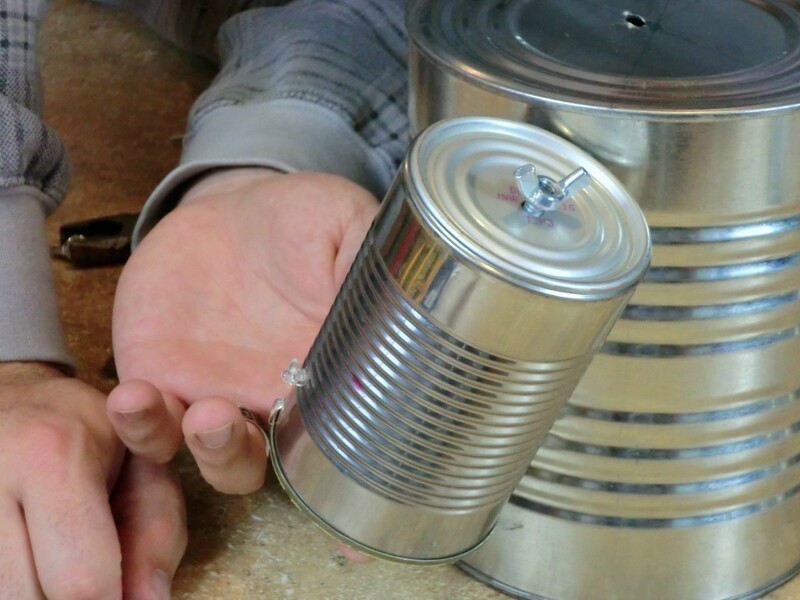 Assemble the body by drilling a hole in the top of the can for the head and sides to attach the arms. You will want to set the arm holes a little towards the front of your robot. 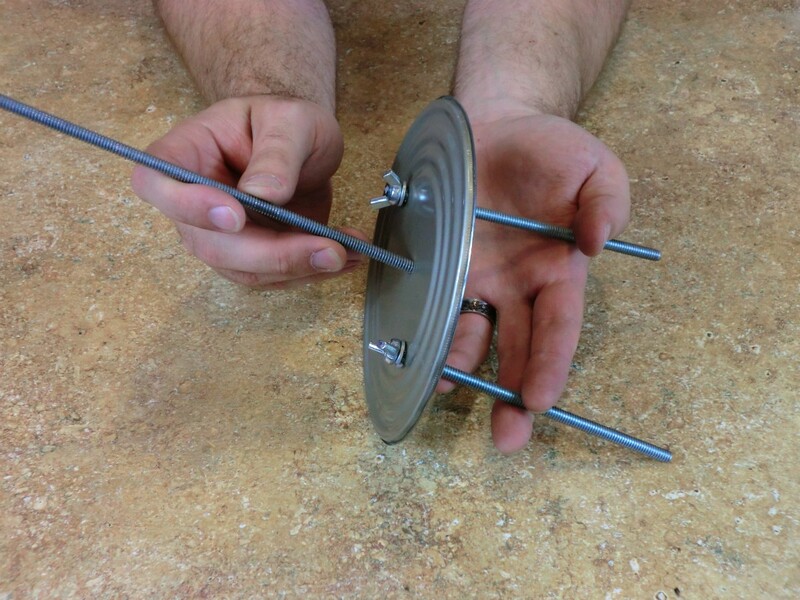 This will ensure that your threaded rod for the body and head doesn't interfere with the threaded rod for the body. Also, having the arms set forward a bit works fine with the balance of the robot, since the feet extend forward a bit. 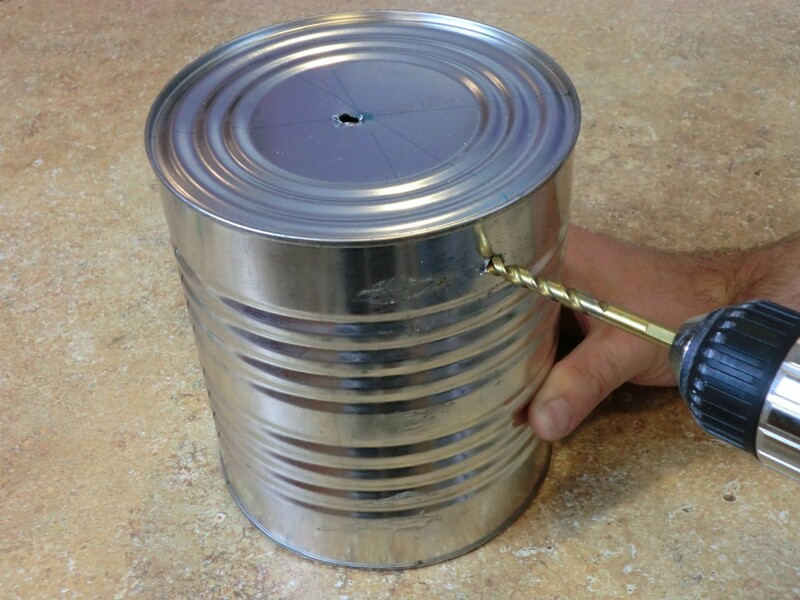 Be careful drilling holes in the side of the can. 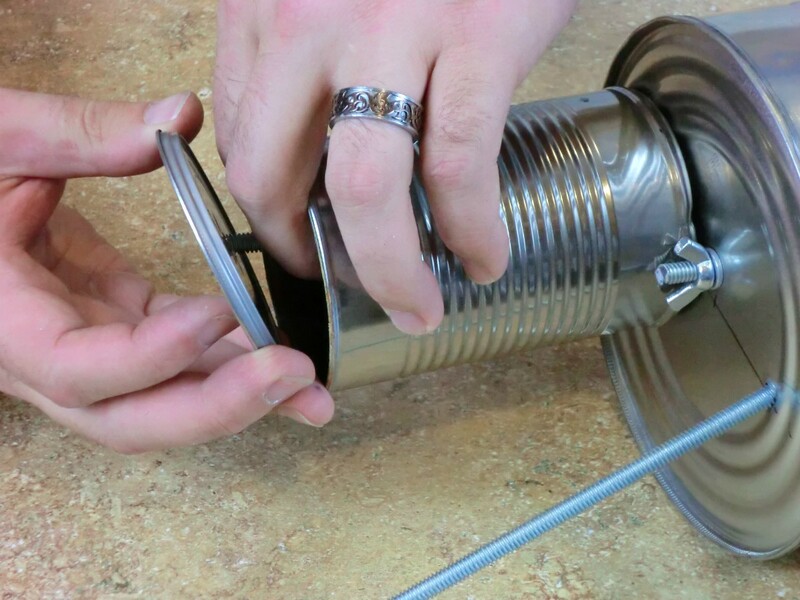 It's easy to bend the can and the bit slips easily. 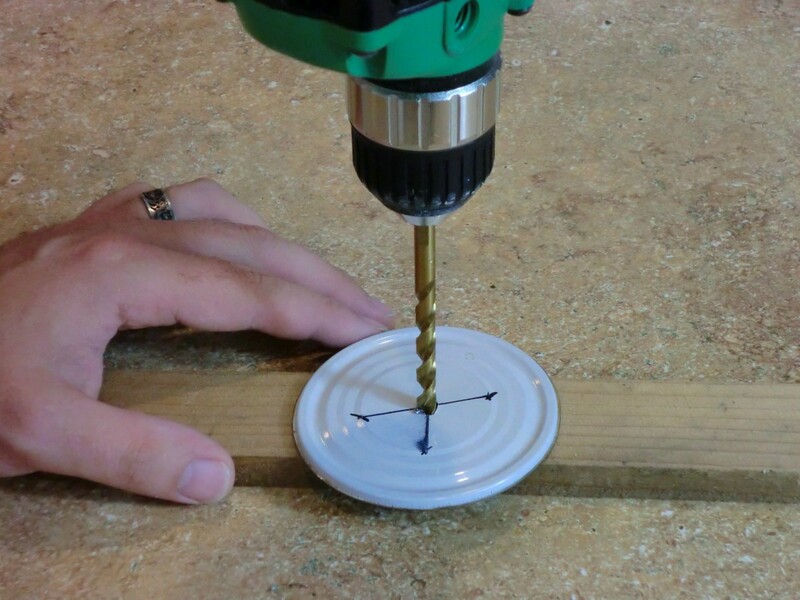 Use a nail to pre-punch the hole to keep your bit from slipping. Now you figure out the placement of your legs. Leave enough room between the legs so you can fit the nut to hold the body together. I used Sharpie to mark up my materials because I eventually will be painting the robot. 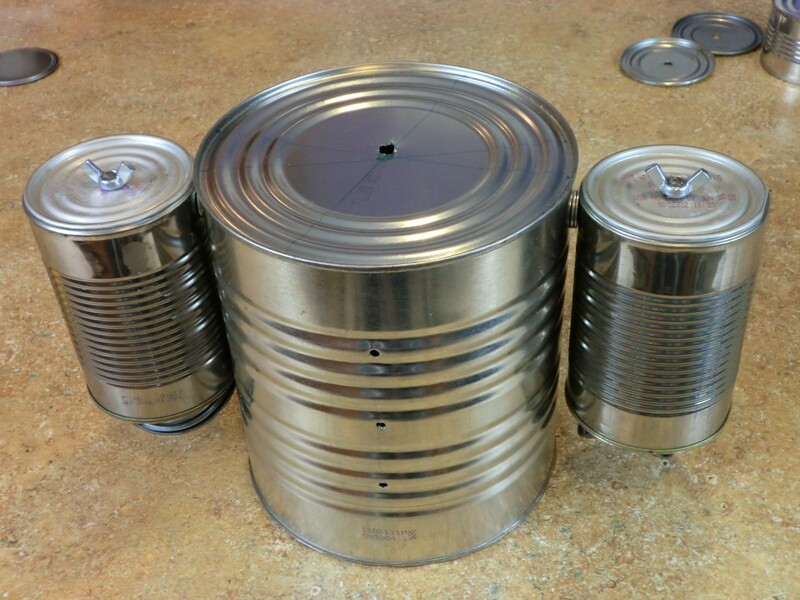 Drill holes in the center of the top and bottom of 4 cans to form the legs and arms. 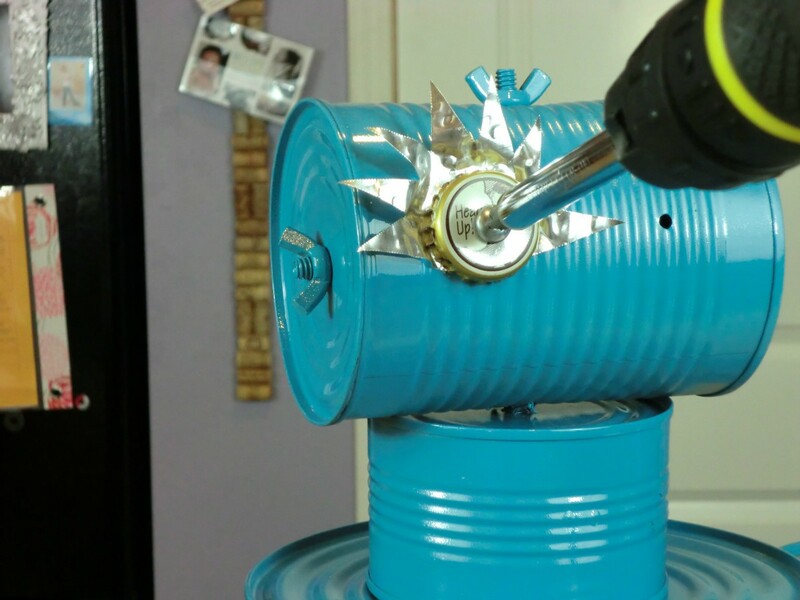 Then take two of those cans and drill holes through the side, near the top of the can. These holes will be used to attach the arms. 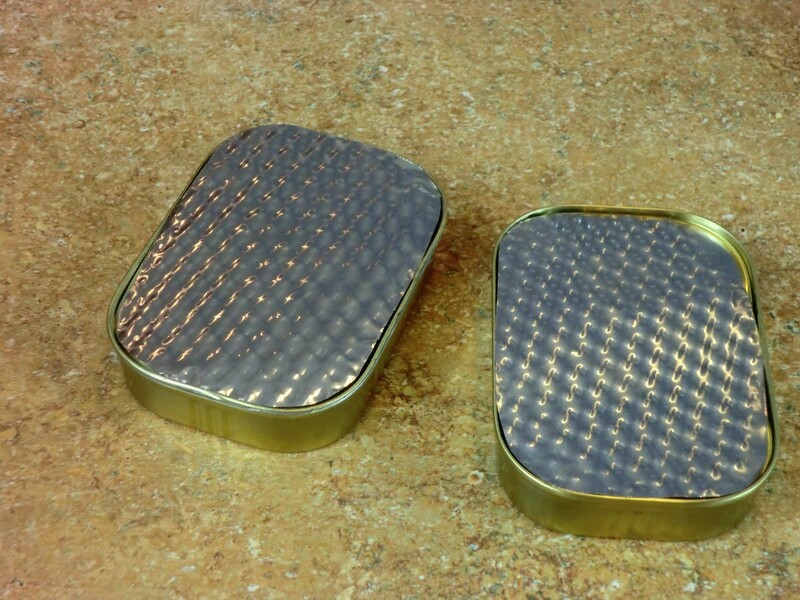 Also, measure and drill a hole in each sardine can, which will become the feet. If you want the body parts to be different colors, paint them before you assemble the robot. 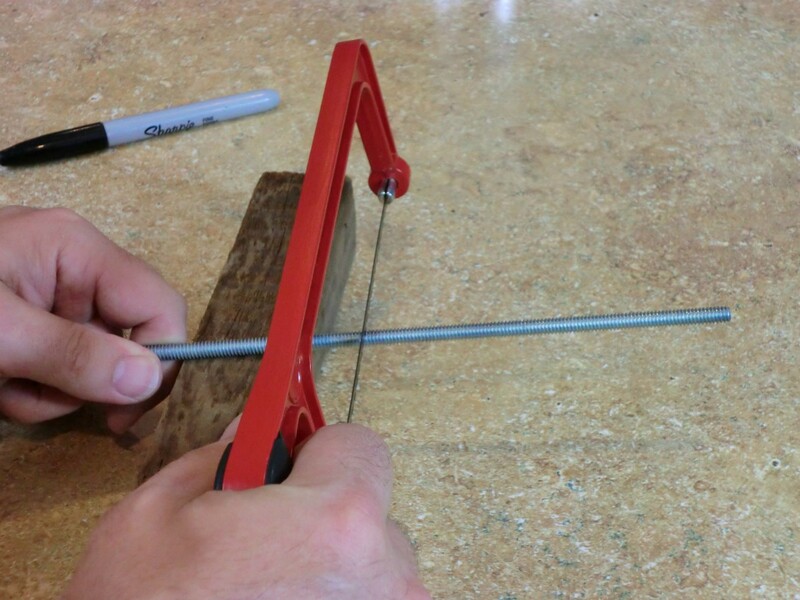 Measure a rod wide enough to go through the body and both arms to attach the arms. Put a couple washers between the body and the arms so they can move freely. 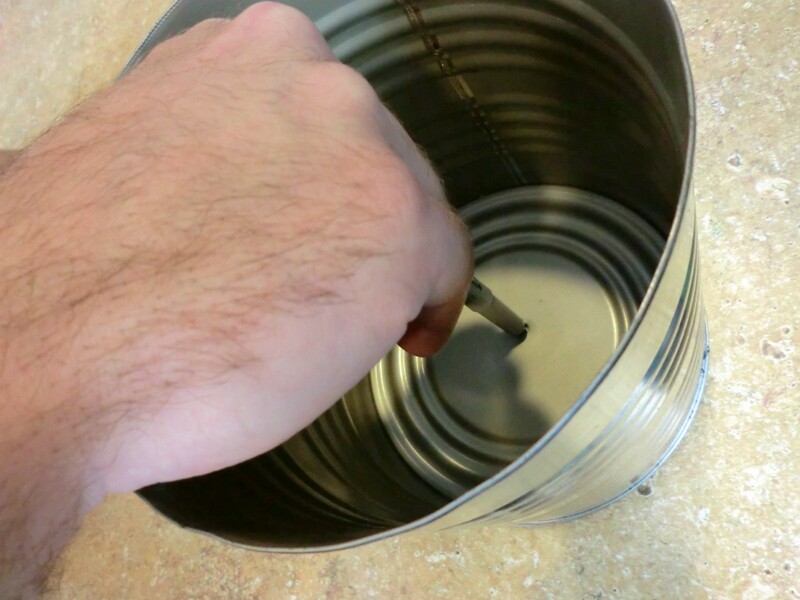 Then bend two lids to become the hands. 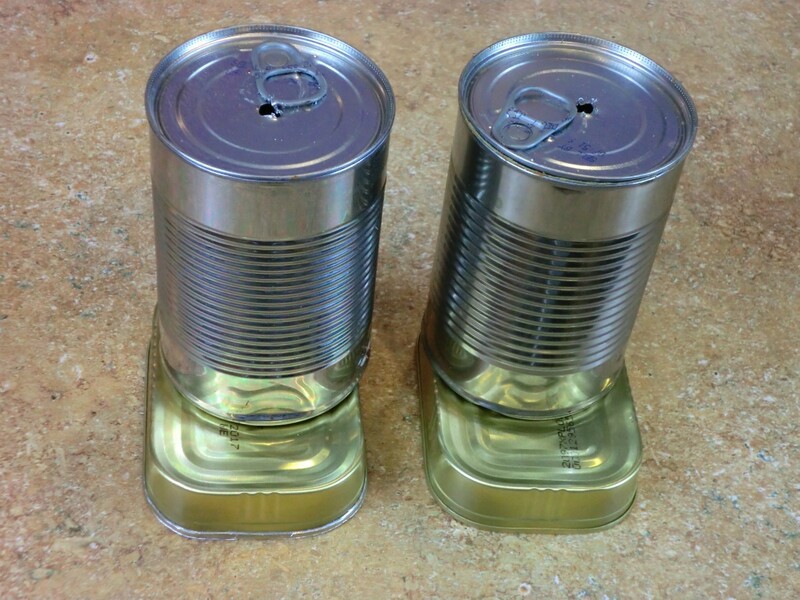 When attaching nuts to the inside of cans I used a lock nuts, on the outside I used wing nuts, which look cool. 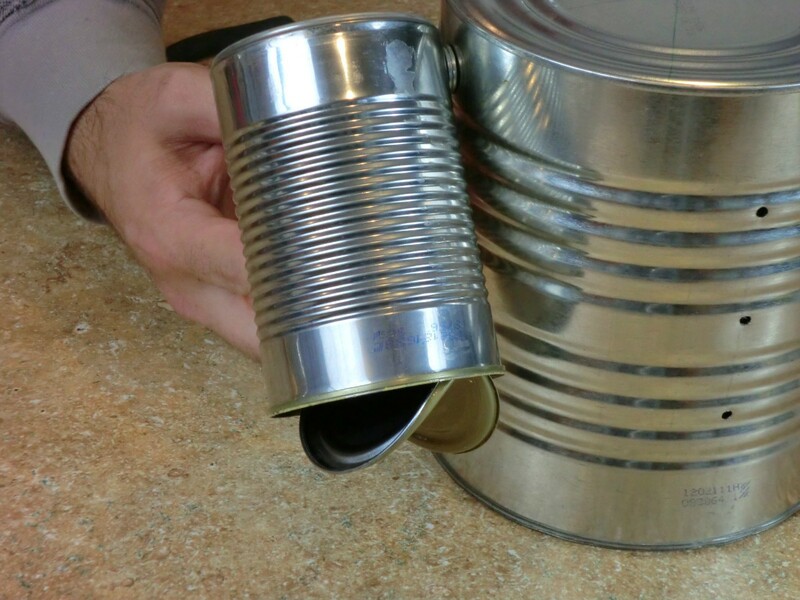 The lid of the large can will be used to attach the legs. 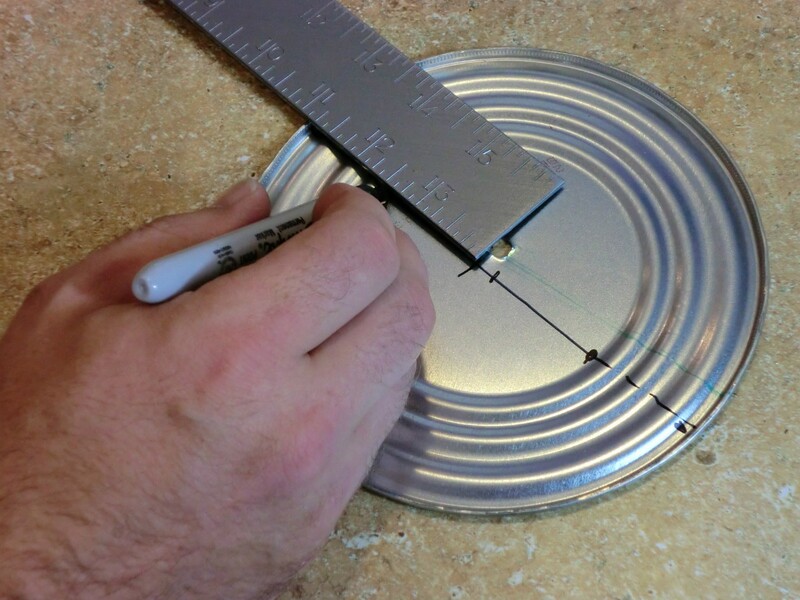 Measure two rods long enough to attach both the legs and feet. 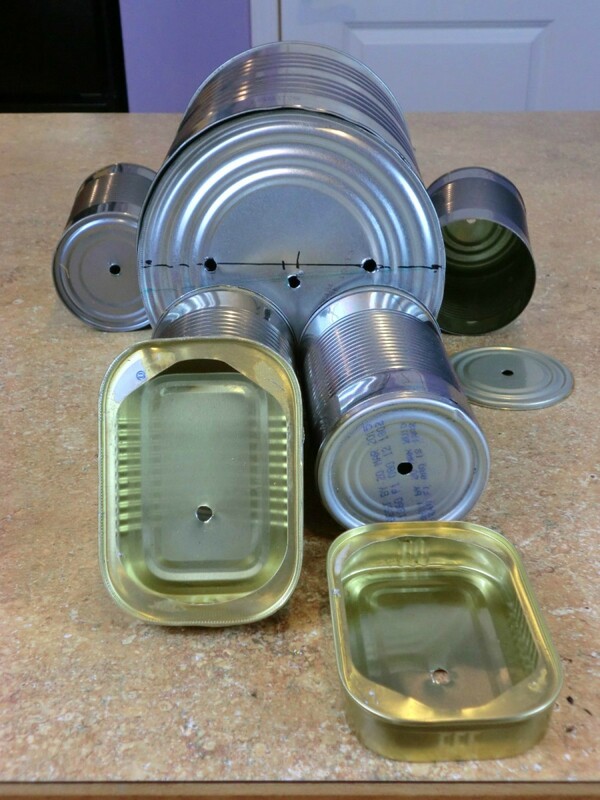 I then used a long rod that extended all the way from the head to the bottom of the large can (the body) using two wing nuts. It holds everything together. Here are the legs ready for assembly! Now, thread the legs through the rod. 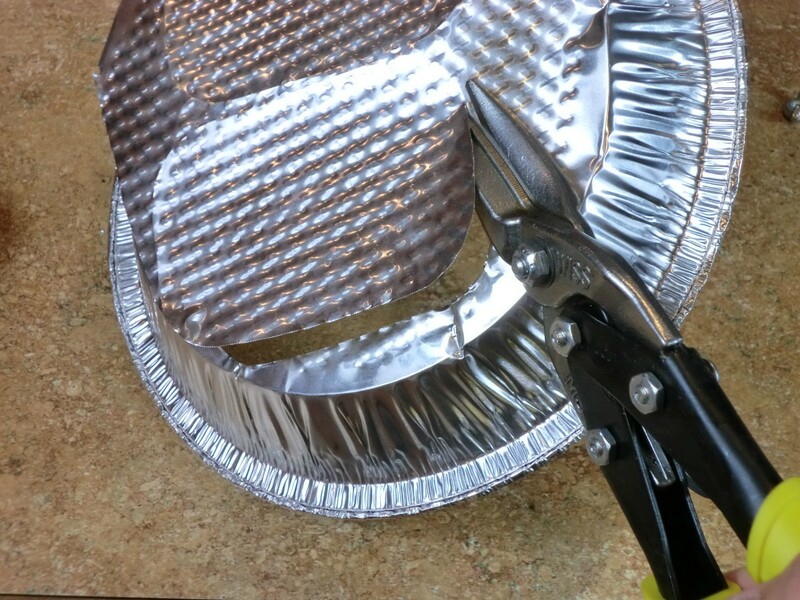 Using a pie pan, cut two bottoms out for you feet. Then attach the feet using a wing nut. Then you can glue the bottom on the feet. It's alive! This is the point where my wife saw how cool it looked and decided she was going to paint it. She ended up painting it a solid color. 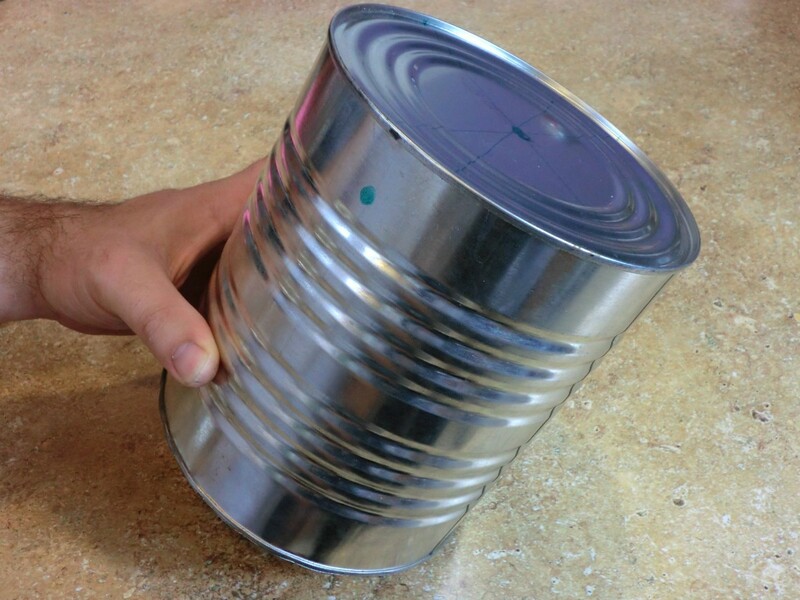 If you want two different body parts to be different colors, paint the cans before assembly. 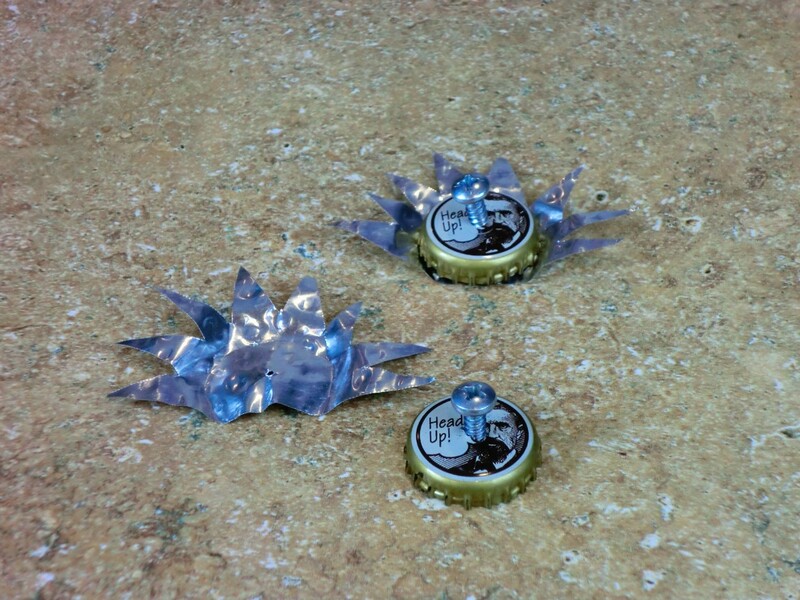 We used bottle caps for eyes and foil for eyelashes. 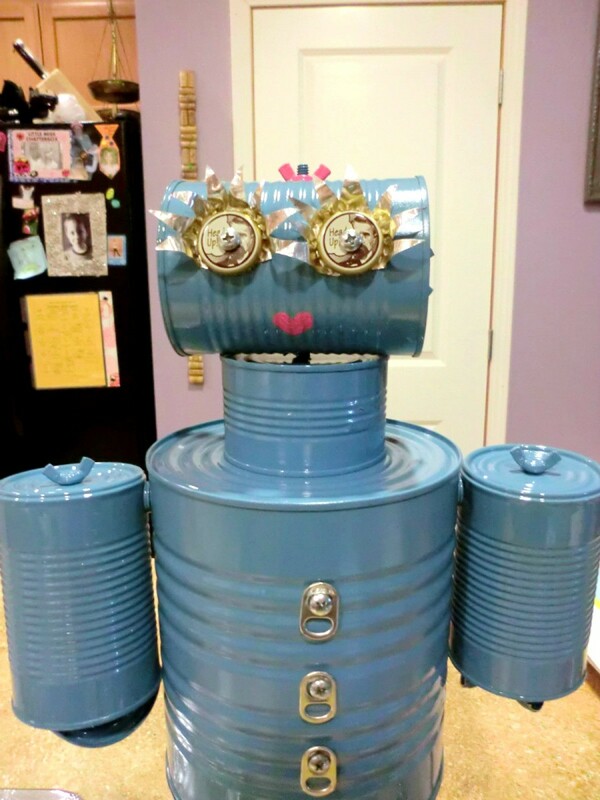 My once manly robot has become a girl. But, she's cute! We added some pop tabs to the front, the possibilities are endless. What a cutie, she looks like Rosie, the Jetson's maid. You do great work! I love this one. 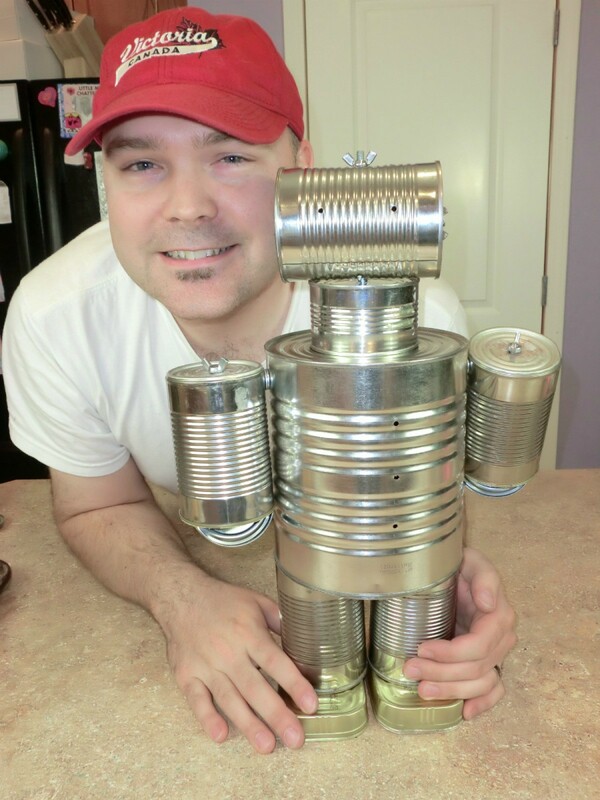 Had made something not so elegant which was a pattern for the Wizard of Oz "Tin Man" which I gave to my son in Florida. It was a real fun project, but yours it absolutely fantastic. 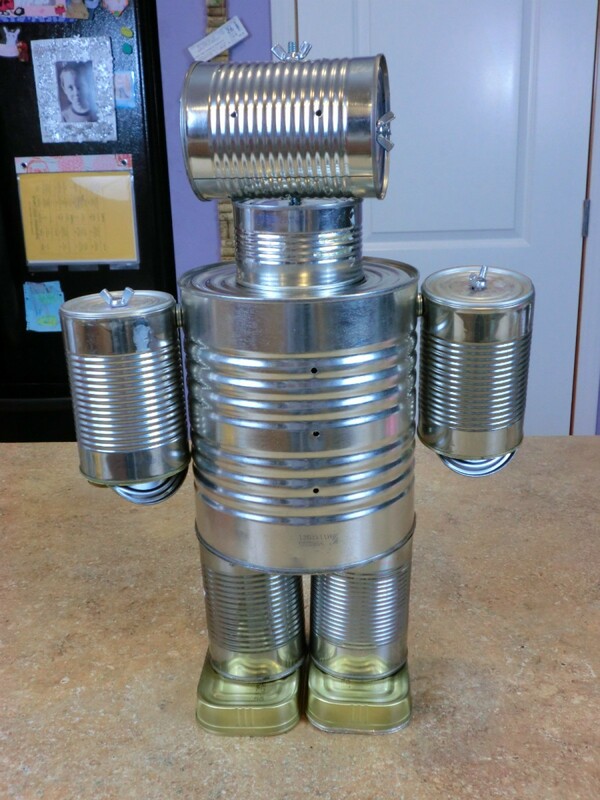 Could I get to directions to make a taller say 5-6 foot tin man? 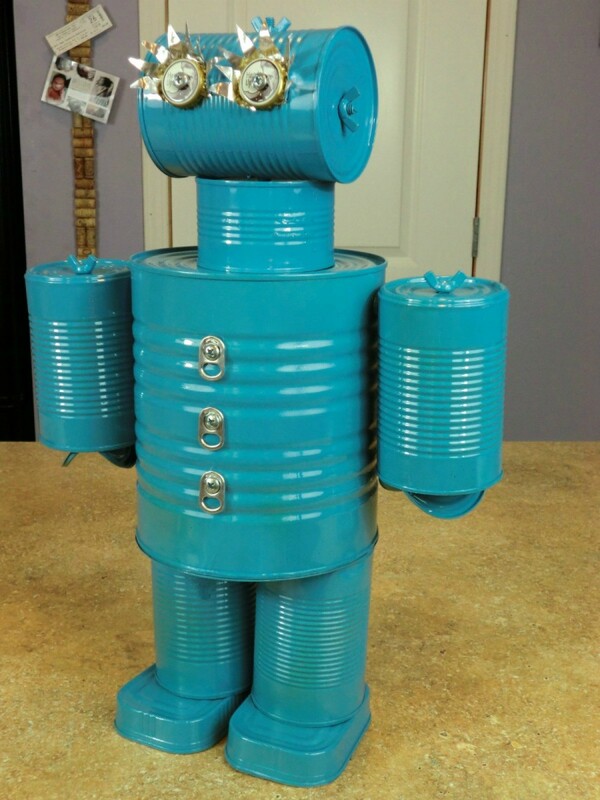 Save your recycled tin or aluminum cans of all sizes to assemble this adorable robot. Learn how to make it in this short video. 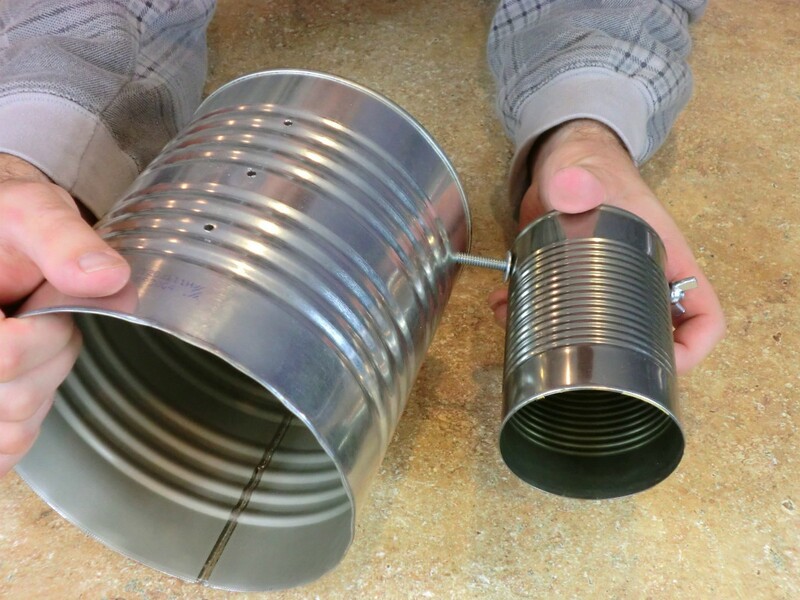 It is so cute I'm going to start collecting my cans right away. But I'm not sure if we have all of the different nuts. 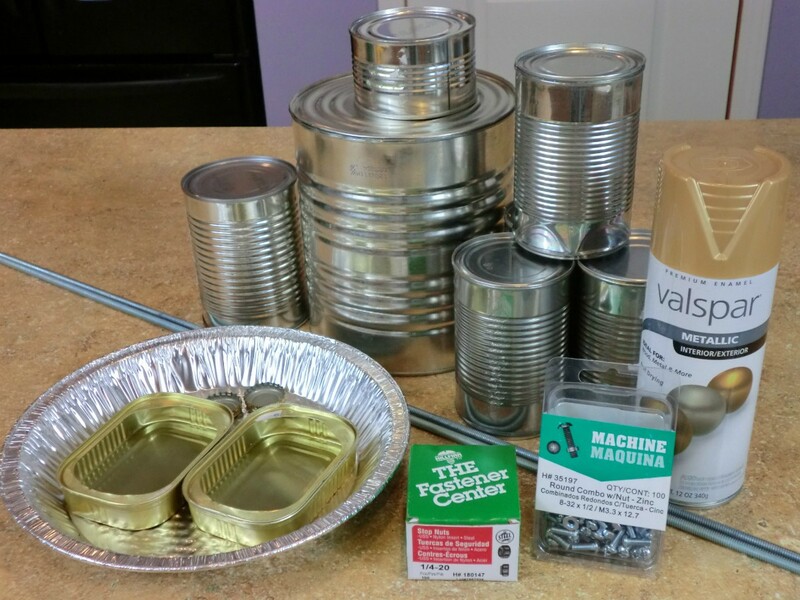 Once we have all the cans and nuts I will start building right away. I haven't tried it yet but I will do it very soon. I think it's nice that your showing people how to make all this stuff. Thanks! 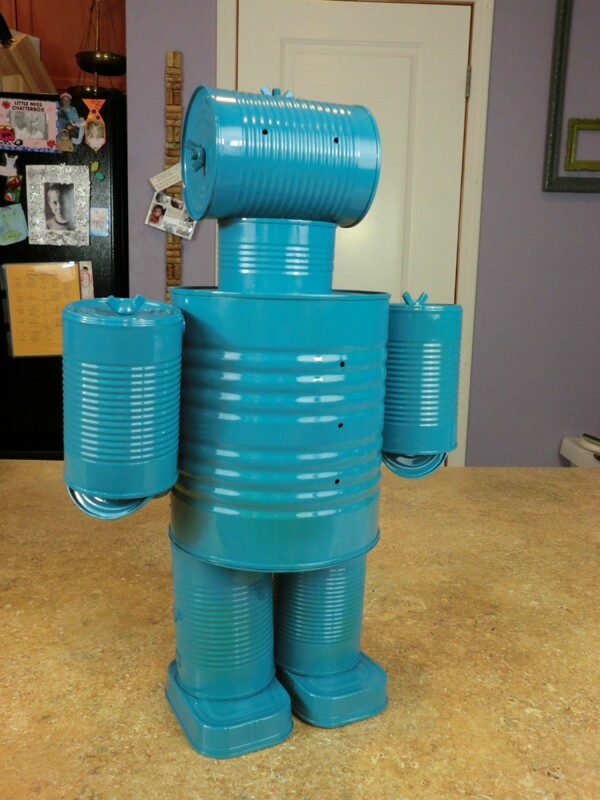 I hope you share your robot with us when you make it.